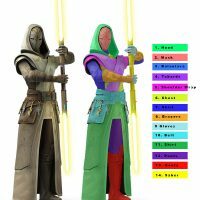 The Jedi Temple Guards were part of the Jedi Order. They wore golden-brown robes with Jedi patterns on them to signify their loyalty to the order and carried special lightsaber pikes which produced yellow blades. 1. Hood: Tan/cream two toned billowed hood that passes inside the shoulder wrap and over the chest piece. 2. Mask: May be either a mask or full helmet as long as no visible edge is seen through the top/side of hood. It is a hard/reflective material with appropriate detail applied. Costumer’s eyes should not be visible. 3. Balaclava: Of brown material in line with the rest of the costume. Bottom edge extends inside collar of shirt. Costumer’s skin/hair should not be visible. 4. Tabards: Cream colored single tabard in the back beginning at the belt that forms a Y as it passes over the shoulders. Tabards cross in the front with the right tabard ending at the intersection and left tabard continuing to the belt. Tabards should extend past the natural shoulder point and turn down slightly. Has appropriate designs applied to the front of the tabards. 5. Shoulder wrap: Cream colored wrap that passes under the tabards and over the hood/chest piece. Piece should extend past tabards and natural shoulder to create a small cap. Has appropriate designs applied to the shoulders. 6. Chest: Cream colored piece that begins at the belt in front and runs at least to the shoulder with a v-neck visible through the hood. Passes under the shoulder wrap/hood and over the shirt. 7. Shirt: Tan colored, relatively form fitting shirt that has a high, overlapping collar. No skin should be visible. 8. Bracers/hand plates: Heavy leather, or similar, bracers with two darker straps and attached hand plates. 9. Gloves: Lightweight gloves of similar color to shirt. 10. Belt: Heavy leather, or similar, main belt with a recess running down the middle and accurate metallic buckle. Thin leather, or similar, hangs below the belt on the back and sides with one shorter flap on either side. There is a small pouch/flap that extends from the main belt in the middle of the back. a. Keys: Twelve metallic keys hang from the belt on angular rings that attach under the main belt. There are two key designs that repeat in varying colors and orientations. b. Saber clip: Metallic clip located on lower portion of the left side of the main belt. Accepts a button similar to covertec, but this is not a standard covertec belt clip. 11. Skirt: Tan ankle length skirt with an opening in front. Brown woven or quilted panel extends to just below the knee. Both main skirt and panel are trimmed in cream colored fabric. 12. Pants: Dark brown fitted pants with no visible pockets/details. 13. Boots: Two tone boot that rises to just below the knee with a front extension to cover the kneecap. 14. Saber (optional): If a saber is present, an accurate Temple Guard double bladed saber is required. If bladed, blades should be yellow.